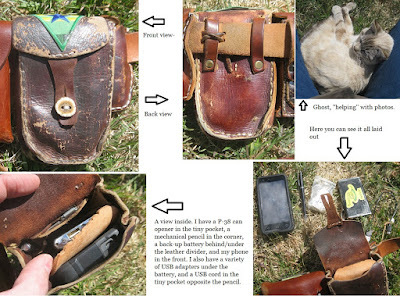 My phone holster is actually my oldest piece of gear, although it didn't start out as a phone holster. It is made of leather (duh!) and measures 6.5" tall, 4" wide, and 2.25" thick. It sits on my right side between the double pouch (behind it) and the sheath for my Buck 501. I made this pouch in the mid-1980s as a way to carry necessary items while working at a pet store. I carried a calculator, scissors, a pen, razor blades, and half a hacksaw blade, plus maybe a few other odds and ends that I'm forgetting. I used this pouch for years, and when I no longer worked at a pet store, the pouch ended up tossed in a box with other leather items and scraps. When I got a new phone a couple of years ago it needed a holster because it was bigger than the previous phone (I'm not one to leave my phone lying around, or to try to keep it in a pocket). I went digging in the leather scrap box to come up with leather to make a new pouch and ran across this one. It fit perfectly! I did add belt loops; originally I just tied it to the belt with leather thongs because I was constantly taking it off when I wasn't at work. That was no longer necessary, so loops were a better idea. As you can see, it is also tied in place. I put a leather divider inside it, for keeping the back-up battery (seen above with the "Time's Up" sticker on it) separate from the phone. That was the only internal change. 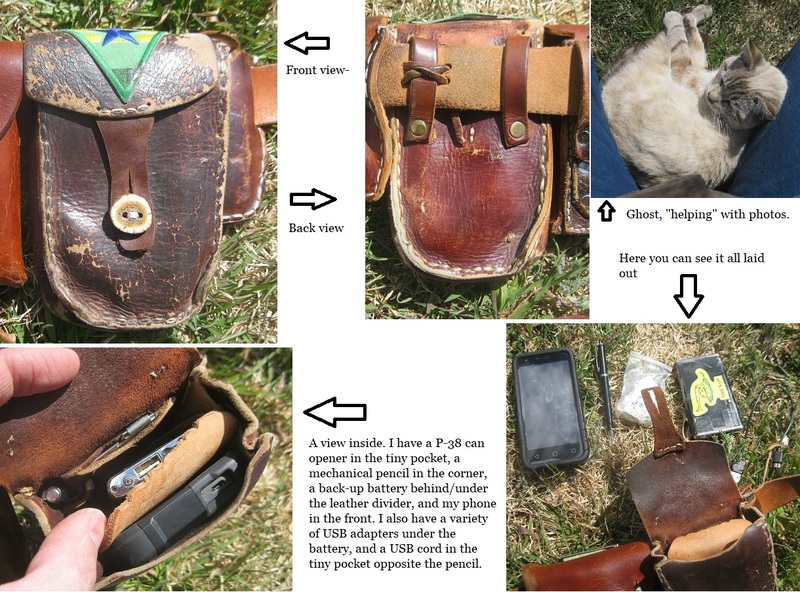 The internal side pocket where I used to keep the short hacksaw blade is where I now keep a USB cord, and I have adapters (in the little ziplock bag-- for sharing a charge with other people) under the back-up battery. The little pocket where I used to keep razor blades is a good spot to store yet another P-38 can opener. It has a Browncoats "Independents" patch on the flap. Frivolity! The button is a cross-section of deer antler. I replaced the button loop about a week ago when the original one finally broke. The new loop is made from boot-top leather. This is probably my most complex pouch. I know this isn't exactly primitive stuff here. I adjust and adapt to changing technology when it suits me. Before cell phones, people would joke with me about being the MountainMan with the cordless phone hooked on his belt at work. It's a concession to the modern world; one that doesn't really bother me because I know I can do without. Like lighters and toilet paper. Part of my philosophy of life is to help other people. I have given other people a charge in an emergency, using the USB adapters. I once gave a P-38 to a guy who needed one. I carry extra stuff just for this reason. All because I'm one of those selfish, independent, individualistic libertarians you hear about.